The historical symbol of love, the heart is the center of our life and our love. 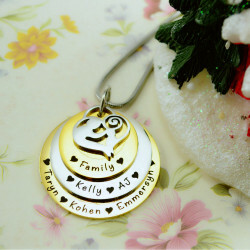 Personalise this&nb..
Show off your family tree in a fun and unique way with the Gold Plated Tree Necklace with Silv.. The love between a mother and daughter is forever... that doesn't mean it's any less for a m.. The Tree of my Life Washer is an extension of the most unique and best selling design.. This beautiful Family Heart Necklace in Silver is the perfect gift for every mum, includ..
Chain length: 60cm (30cm drop). Pendant dimensions are 2cm x 3cm For example, the cost of the materi..